Srinagar, February 27: With the tension between India and Pakistan rising after Indian Air Force stroked the Jaish-e-Mohammad terrorists’ camp in Balakot area of Khyber-Pakhtunkhwa province of Pakistan on Tuesday morning, the United States’ Secretary of State Mike Pompeo issued an official statement on Wednesday stating Pakistan to take meaningful action against terrorist groups operating in its soil. He also said that both countries should prioritise direct communication and avoid further military activity. Expressing his opinion on the recent tension in the sub-continent following the IAF attack on JeM camps in Balakot, Pompeo in his statement said, “Following Indian counter-terrorism actions on February 26, I spoke with the Indian Minister of External Affairs Swaraj to emphasize our close security partnership and shared goal of maintaining peace and security in the region.” US Secretary of State Mike Pompeo Apprised of IAF Raid in Pakistan's Balakot: Sushma Swaraj at All Party Meeting. Through his statement, he appealed to both the Minister of External Affairs of India and Pakistan to exercise restraint and avoid escalation at any cost. Also, he tried to encourage Swaraj and Qureshi to prioritise direct communication and avoid further military activity. 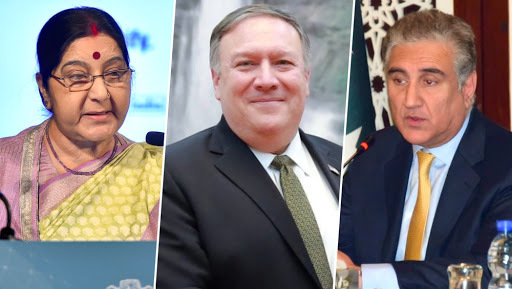 Earlier, on Tuesday, EAM Swaraj had spoken to the United States Secretary of State Michael Pompeo over Indian Air Force conducted surgical strikes on terror camps of Jaish-e-Mohammed (JeM) in Balakote. Advisory: We request our readers to wait for an official word from Indian officials before reaching any conclusions or circulating messages on social media.